Tonight Nelson and I were deep in prayer at our weekly prayer meeting when Max snuck outside. We sent one of the big kids to retrieve him from the courtyard where lots of toddlers were roaming wild and free. When he came back to his place he stood right in front of where I was sitting with a very perturbed look on his face. "Mama," he said in all his five-year-old seriousness as he held out his fingers, "I was this close to tagging Ian when Aiden came to get me." "Max," I reminded him, "you are not supposed to be outside. You HAVE to ask before you do things like that." He looked at me with a very straight face as he said, "But Mama, if I would have asked you, you would have said no." 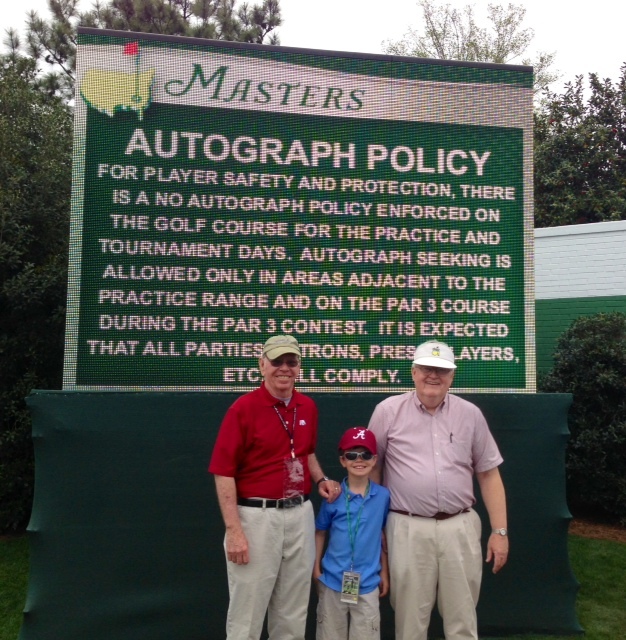 A few years ago the Augusta National instituted the Junior Pass. This allows one child 8 years to maybe 15 to go to the tournament with a badge owner. 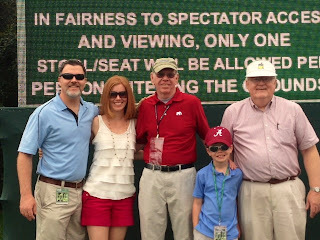 Lucky for us, Nelson's dad has had tickets to the tournament for a very long time and was eager to take each of his grandchildren to the tournament the year they turned eight. This was Dawson's year and Sunday was his day. 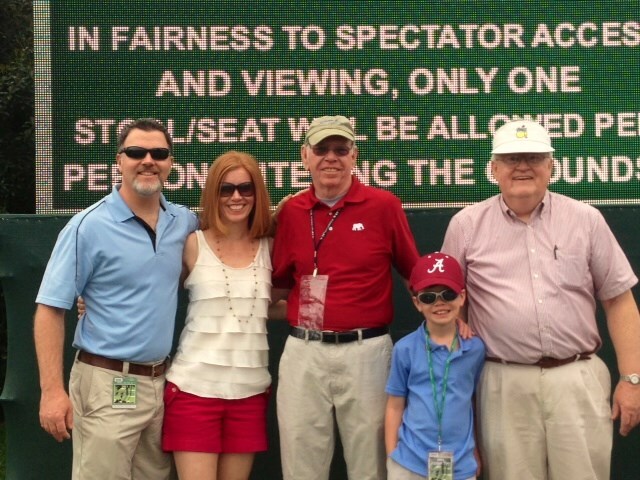 Like my other kids, the first words when we met him at the gate to exchange the tickets were about the things he got from the pro shop and what he ate from the concession stand. He also had a stack of Master's cups in a plastic bag which he proudly told us he had been dumpster diving to retrieve. Yep, we're that classy. He was proud to have garnered such valuable loot as a collector's plastic cup without paying a dime. 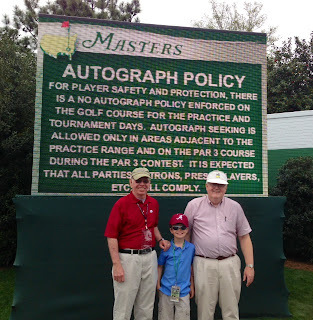 Upon further review the next day, we did discover that he also saw many famous golfers as well as got his picture taken in front of the clubhouse with his two grandfathers. I love the tournament. It's the one week of the year I follow golf and get to marvel in the beauty of the course. However, over the last several years it has not escaped me that the most precious gift of all is seeing each of my children walk out of that gate beaming from ear to ear flanked by his two grandfathers. What a spectacular memory for all of them. What a gift it is! your five-year-old makes a strike playing Wii bowling and shouts, "Yes! A bowl in one!" This is a season. Just a season. That word helps me get through knowing that sooner or later a change is going to come. Change is good. It's pedal to the metal this week for me with the fundraising aspect for the Glory Run. I have gained a greater appreciation for what my husband, the salesman deals with all day long. Phone ringing non-stop. Shooting emails and texts. Crunching numbers. Double checking facts. It's a lot to throw into the mix when you already have all that going for the four kids you're trying to keep inconspicuously (and quite impossibly, I might add) in the background while doing all these things. The shirts go to the printer on Friday which means, I can't get any more sponsors after that. It won't, by any means, be the end of my duties for the race, but it will take some pressure off. This too shall pass. We're also in a season wherein the kids are at each others' throats all...the...time. There was a time when I couldn't stand being around my own brothers, who I now count among my very best friends. I'm praying this too shall pass. It is a season during which at the precise time of day when I'm ready for everyone to wind down, they turn up the volume, silliness and every other thing that manages to drive me crazy. If I could put them to bed the minute they walk in the door from school, this problem would resolve itself. Mornings are not so bad. Right now they lack the maturity and self control that requires them to know that at the end of the day, it's time to turn it off. This too shall pass? Sometimes, however, I’m so busy waiting for the change of seasons that I miss the beauty of the one I’m in. Working on the Glory Run is hard. It is also exhilarating and somewhat empowering to have the ability to raise such a large amount of money for my kids and their school. I graduated from high school with the race coordinator and I love this time of year because I get to spend so much time with her. She is better than me and works harder than me. She inspires me. In the midst of their strong disliking of each other, the kids genuinely do love each other. Sometimes I have to look harder than others to see it, but it's there. I know one day they will grow up, get some space between them and learn that they appreciate each other. Theirs' will be a very strong bond...someday...I just know it. As for the end of the day downhill spiral, I believe, or at least I've been told, that someday I will miss all this. Someday my house will be quiet and empty and I'll have to go visit the grandkids to experience some of this wild and crazy life. The silliness is often where I can at least appreciate that they must love each other if they can make each other laugh uncontrollably. One day, when they can rein it in, they will be enjoyable and entertaining people. That day may be way down the road, but it will come. Change is good. It really is. But if I didn't have my current situations, I wouldn't appreciate the change at all. Each season necessitates the next. And that, well, that's good too. Tonight at dinner Max announced, "I can count by two's all the way to thirteen." I had forgotten that fundraising is a full time job. I am so impressed by mothers who pull off working from home. Inevitably, my biggest sponsors will call in the middle of dinner, after school chaos or while kids are giggling uncontrollably. Emails need to be taken care of while dinner is cooking, I'm waiting in the carpool line or supervising clothing choices. Tuesday I had one of those days where I had this brief moment of lucidity. I was talking on the phone while shooting off an email and putting together sponsor lists. Wow, I thought. I really am supermom. Then the kids came home and all three big kids had piano lessons so there was the check to write, rehearsal time to supervise and homework to be done. In the middle of that I was cooking dinner for two families. While child two was at piano a neighbor came by to borrow some movies and clothing. She brought her two young ones with her. While all that was going on, I also got a call that the kid playing at a friend's was injured and needed to be picked up. I glanced at my clock to see what time it was and thought I was fine...until I got a call from son number two about why Mackenzie was so late for piano. Somehow I had gotten it in my mind that her lesson began when it was supposed to be finished. Win some. Lose some. I was juggling the balls and dropped all of them at the same time. Dinner was late, the rolls were over done, the injured son never got any attention, and the lesson was almost missed. That night, when we finally sat down to eat ourselves, my phone rang and I ignored it. Sometimes I make good choices. In other news, I've been asked to speak at a town wide Miracle and Healing Service tomorrow night. I wrote that talk today. In the past this would not be acceptable. It would have been done a week before and memorized by now. This week the time I had for it was half an hour this morning and another brief bit tonight to practice and time it. I'm hoping beyond all hope that God will work mightily through my weakness. So that's what I've been up to among scheduling doctor's appointments, preparing for Max to have a tooth pulled, dealing with a backyard bully, visiting sponsors and helping out a friend in need of a ride to the car shop. If you see me and I don't remember your name, you now know why. Pray for me tomorrow night. Hopefully I’ll remember what time it starts so I can get there before my time to talk. I've been trying for three days to upload some Easter shots to no avail. This is the second time Blogger has done this to me this year. Anyone out there having similar problems? Does anyone have any suggestions for an alternative to Blogger? Tonight's dinner conversation focused on The Avengers cartoon series the kids have gotten hooked on after watching the actual movie. The boys were asking Mackenzie to tell them which character she thought they should be. It went around the table until she got to Dawson and said, "I think Dawson could be Thor." Max jumped in quickly, "Mama should be Thor because she has great hair."